So I have a few private keys I generated for Public-Key SSH authentication. In Windows I manage SSH keys with Pageant - an SSH authentication agent for PuTTY. PuTTY is an awesome SSH/Telnet client for Windows that also comes with a suite of helper utilities like key generator and agent. My work week starts like this: I log into my Windows workstation, open Pageant and load my keys one after another. Since the keys are encrypted I have to enter a password for each key. Once the keys are in memory I can securely log into multitude of Linux servers (that have the public key) without enduring their login prompt each time. Pretty nice, but there is still some room for improvement. 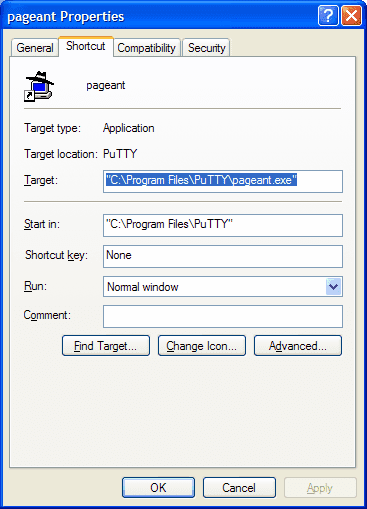 go to Start menu, then "Programs", right click on the Startup folder and choose "Open"
right-click inside the folder and select "New", then "Shortcut"
browse to your PuTTY installation, for example "C:\Program Files\PuTTY" and select "pageant.exe"
right-click the newly created shortcut and select "Properties"
Start in: "C:\Documents and Settings\myaccount\My Documents\myKeys"
Much better! This single shortcut will start Pageant and load the keys. If the keys are stored encrypted, Pageant will request the passphrases on startup, otherwise they'll be loaded without any prompts. If Pageant is already running, this will simply load the keys.